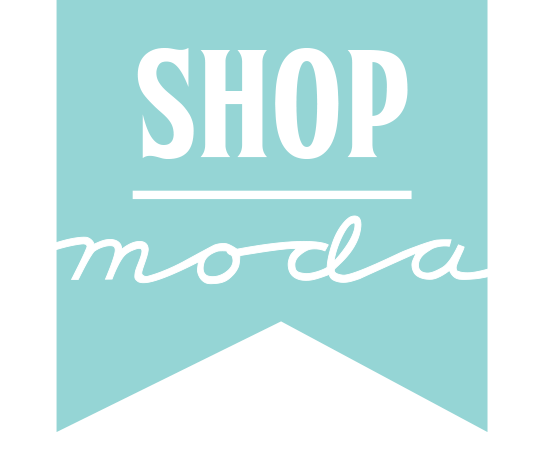 Hello Moda Bake Shop readers! 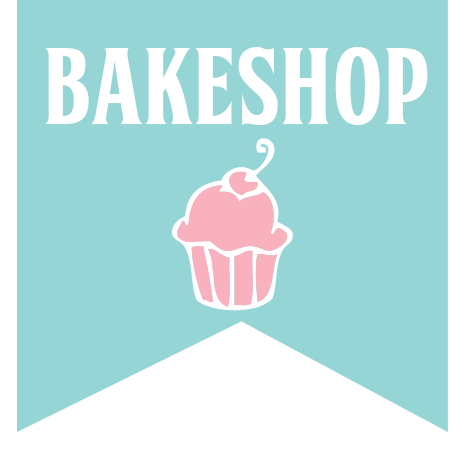 I am a new chef here, and I am honored to be a part of the Bake Shop. I blog at Live. Love. Create. and love bright, bold colors and modern designs. 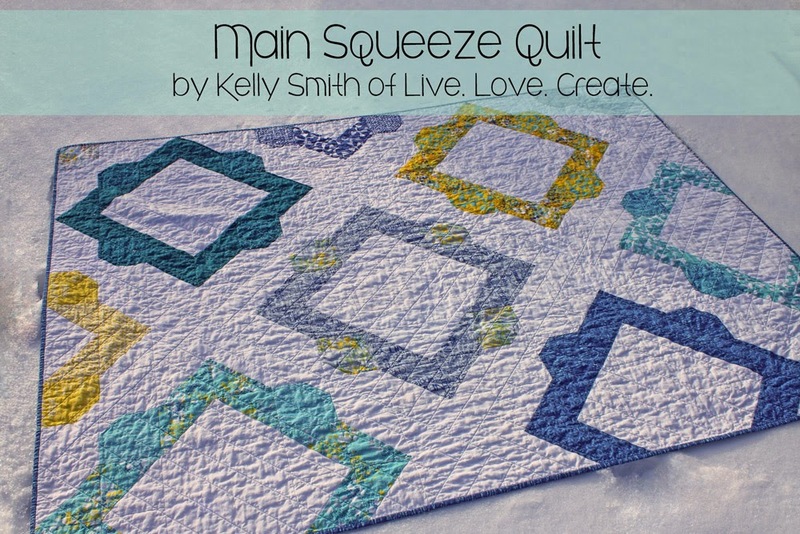 My quilt design was named Main Squeeze based on the X and O blocks it creates, like a “hugs and kisses” quilt. This pattern yields a large throw sized quilt, 60 by 80 inches when finished. 19 Fat Quarters of coordinating colors, I am using Sphere by Zen Chic. Step 2: For the rings, I labeled each ring with the letters A-J, then labeled the half-square triangles number 1 and the “gem” square number 2. 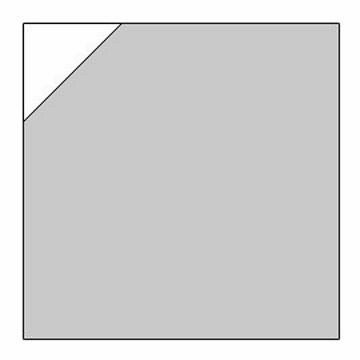 The blocks I call “gem blocks” are the squares that just have the small triangle in the corner, as seen below. So the first ring on the top left of the quilt will need two different fat quarters, fabrics labeled A1 and A2, and so on. 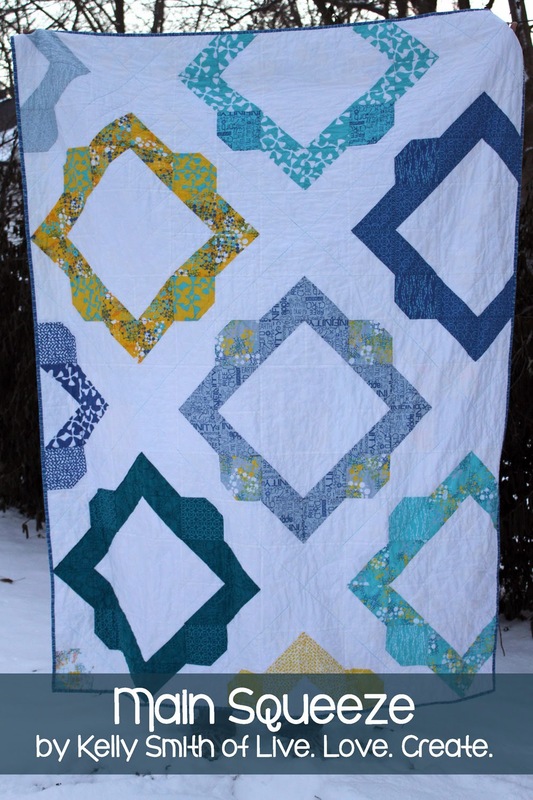 Each ring in my quilt was made up of the same color fabric in two different prints, and the amount needed is based on this layout. 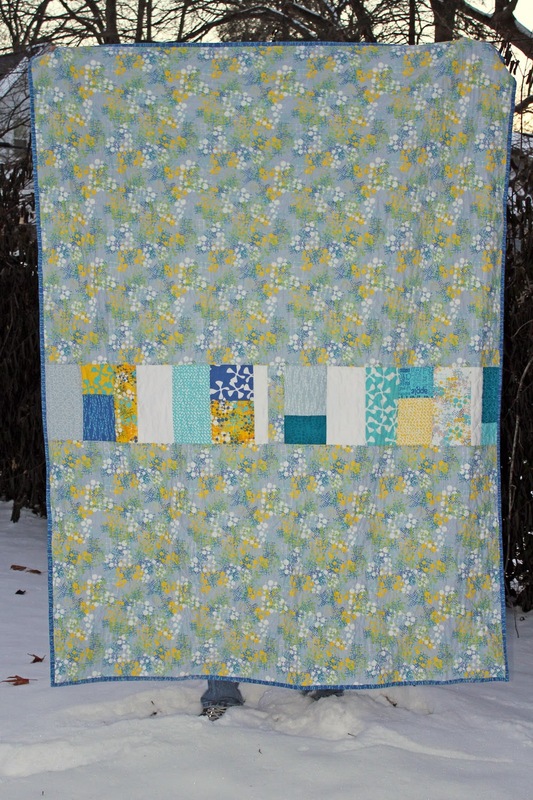 You can download a printout of this quilt, so you can test your color combinations here. I think it would also look great if the “gem” blocks are a contrasting color to give each ring some pop. 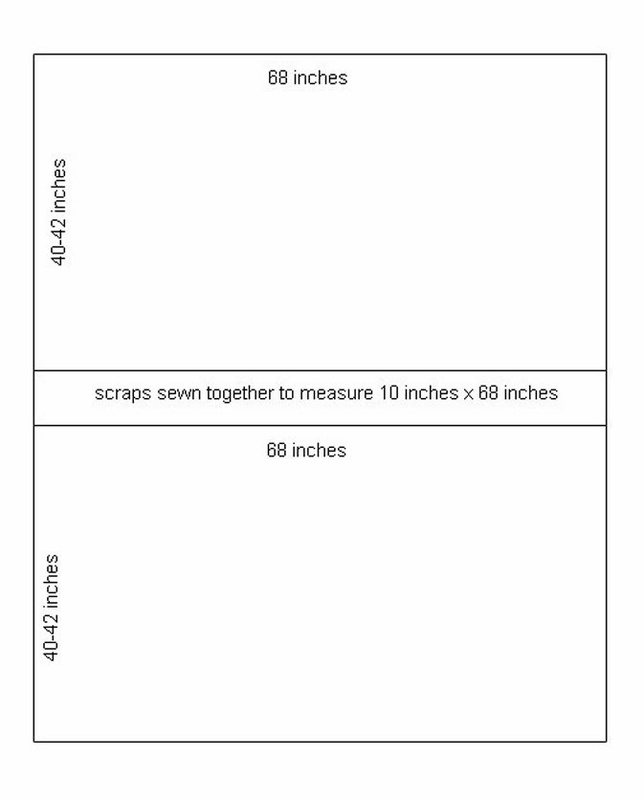 From your 19 fat quarters cut the following. To keep everything organized, I kept all my fabric and blocks labeled with sticky notes throughout the quilt top assembly, like in the picture below. 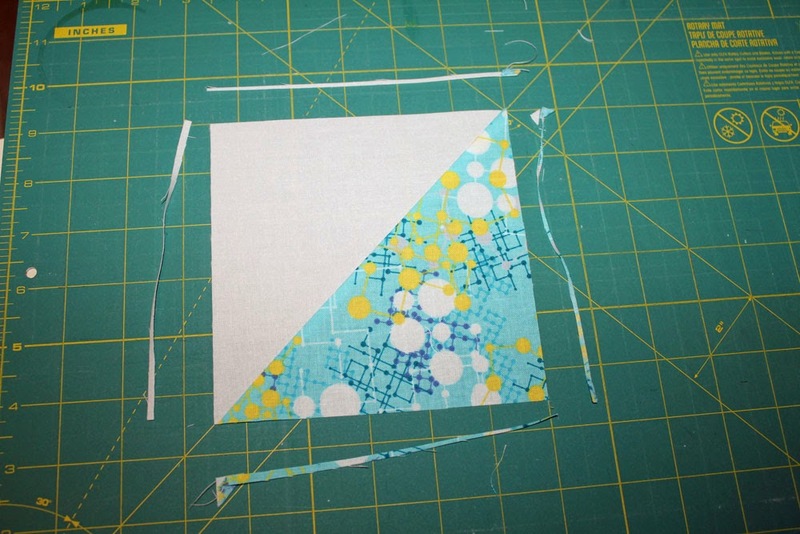 Step 3: Sew your half-square triangle blocks. Take one 6-inch background piece and lightly draw a diagonal line from one corner to the opposite corner on the back. Repeat this for all your 6-inch background pieces. Step 4: With the right sides together, place one background piece and one A1 square together. 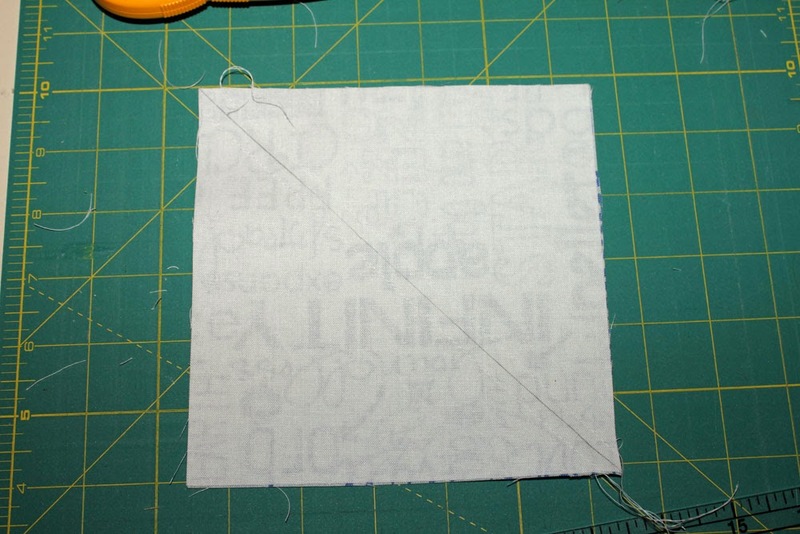 Sew a scant 1/4 inch away from the line you drew on your background piece, and repeat on the other side. Your block should look like this when both sides are sewn. Repeat for all remaining blocks labeled 1. 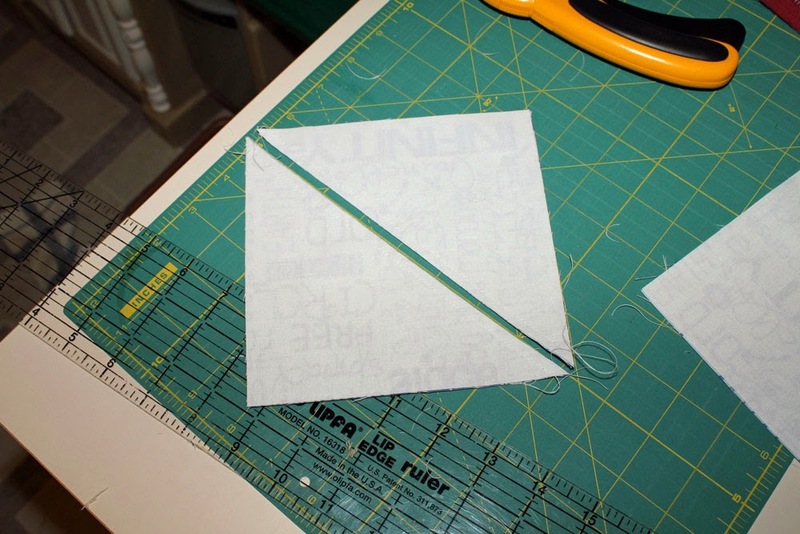 Step 5: Cut your half square triangles in half diagonally, on the line you initially drew. Press the seams to the darker print. Step 6: Carefully trim your half square triangles to 5.5 inches. I line up my blocks with the seam on a 45 degree line on my mat, with a little bit of overhang on each side. I like to cut from all four sides to yield a more accurate cut, but be careful, you will not have much waste! Step 7: Take your 2.5 inch background pieces and again lightly draw a line from one corner to the other. Step 8: Place one 2.5 inch background piece in the corner of one 5.5 inch A2 block. Sew just off of the line, on the side closer to the corner. Note: If you sew directly on the line you drew, when you press your block out you will lose a tiny amount from each block. Step 9: Trim excess fabric 1/4 inch from the seam. You can also opt to leave this fabric on for extra stability. Press the seam toward the background fabric. Repeat steps 8 and 9 for all of your blocks labeled 2. 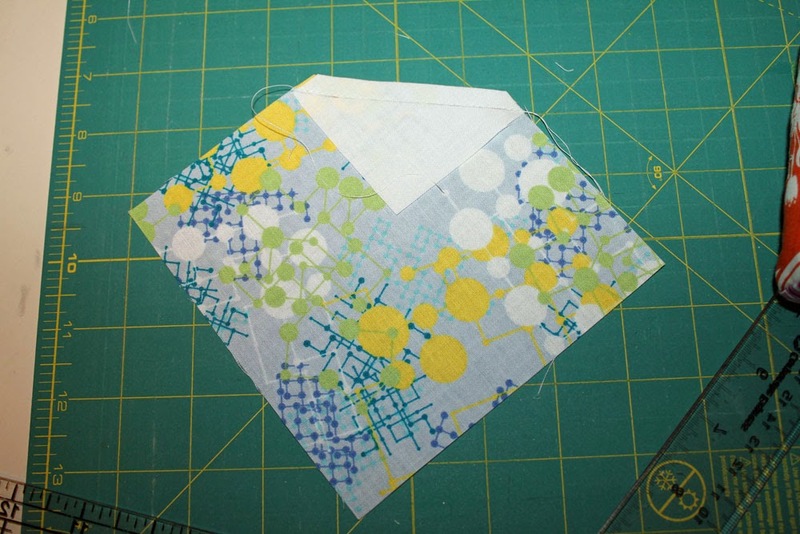 Step 10: Grab four of your A1 half-square triangles (HSTs) and sew together to create a “V” block. I pressed the seams to the side, alternating the direction so I could nest the seams. Repeat with four B1 HSTs, and four C1 HSTs. Step 11: Take one A2 block, one B2 block and two 5.5 inch background pieces and sew together to form a bow tie block, like the following diagram. I pressed seams to the side, alternating the direction so I could nest the seams. Repeat for one block with a B2 and C2 block and one block with a C2 and D2 block. Step 12: Arrange your first row according to the diagram below and sew together. 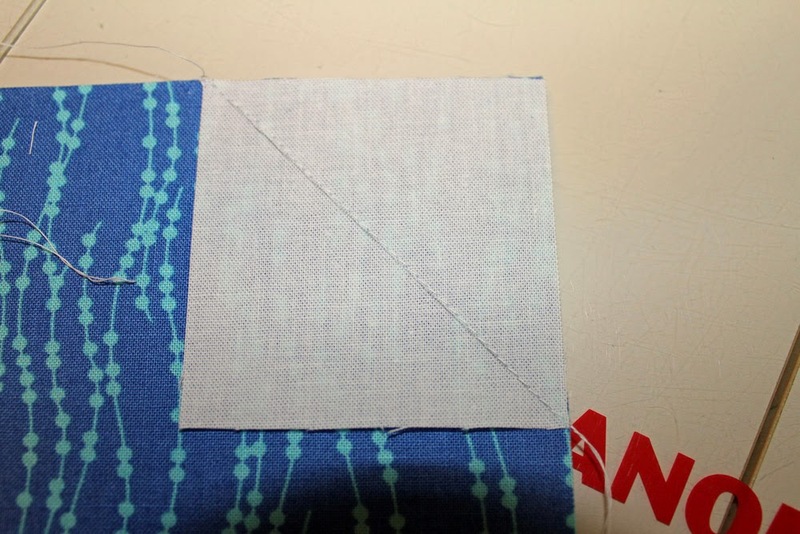 If you are pressing your seams in order to nest them together, you want to press the first seam (between your A1 “V” block and A2/B2 bow tie block) to the right. Step 13: Repeat step 10 with four A1 HSTs and eight C1 HSTs. Layout your “V” blocks with your 10.5 inch background pieces according to the diagram below. 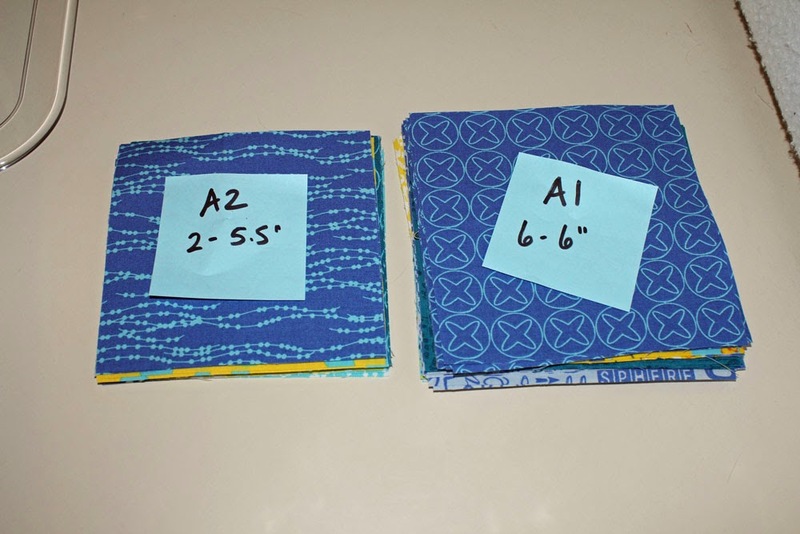 Step 14: Make one “V” block each using your A1, C1, and E1 HSTs. Make one A2/E2, one C2/E2, and one C2/F2 bow tie block. 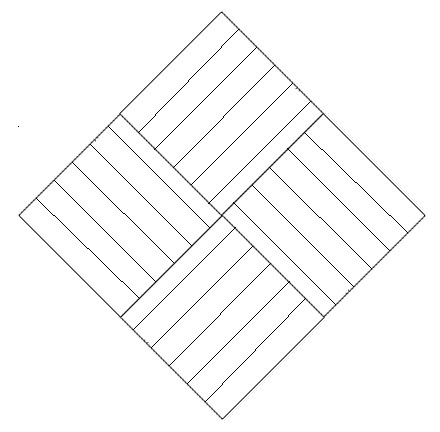 Arrange these blocks to form your third row according to the diagram below. Step 15: Make two E1 “V” blocks and one F1 “V” block. Arrange them with your 10.5 inch background squares according to the following diagram. 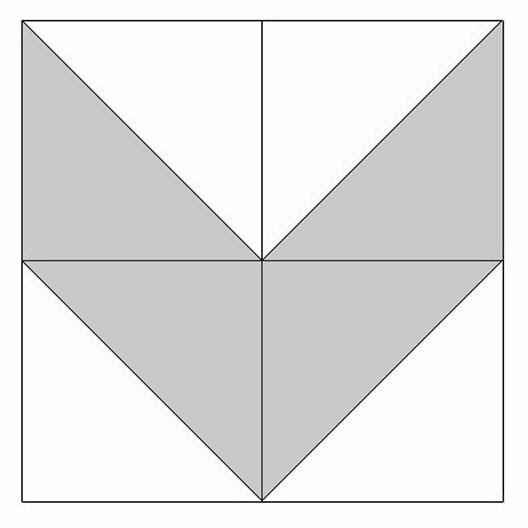 Step 16: Make one “V” block each using your G1, E1, and H1 half-square triangles. Make one G2/E2, one E2/H2, and one F2/H2 bow tie block. Arrange these blocks to form your third row according to the diagram below. Step 17: Make two H1 “V” blocks and one G1 “V” block. Arrange them with your 10.5 inch background squares according to the following diagram. 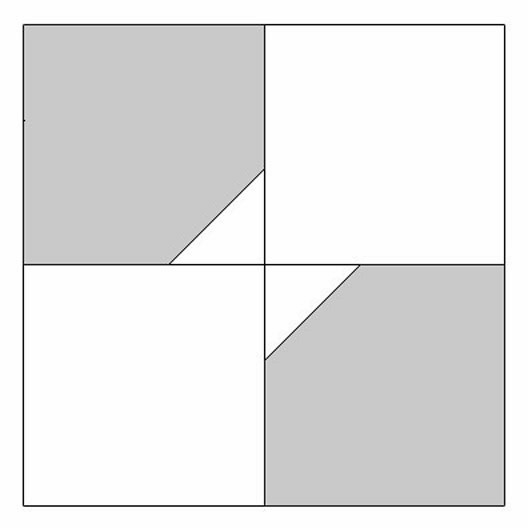 Step 18: Make one “V” block each using your G1, I1, and H1 half-square triangles. Make one G2/I2, one H2/I2, and one H2/J2 bow tie block. 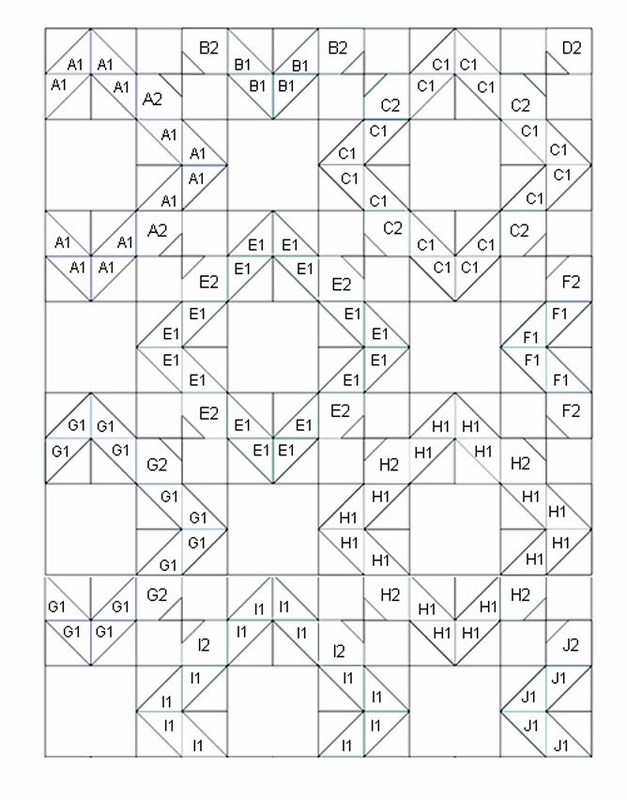 Arrange these blocks to form your third row according to the diagram below. Step 19: Make two I1 “V” blocks and one J1 “V” block. Arrange them with your 10.5 inch background squares according to the following diagram. Step 20: Pieces your rows together and press well. I like to sew two rows together at a time. So instead of sewing them on in order, adding each row individually, I sew rows 1 & 2 together, then rows 3 & 4, etc. Then I sew one of the double rows to another double row, and end by sewing the two halves of the quilt top together. I find that it is easier to sew the top together this way so you do not have all the weight of the quilt top when you sew each row on individually. Step 21: Cut your background fabric into two 68 inch x width of fabric pieces. Remove the selvages and you should have two pieces that are 40-42 inches wide. I also grabbed all of my scraps and pieced them together to make a 10 inch x 68 inch patchwork piece. Without this piece your back may not be large enough, since I like to have my quilt backs measure 8 inches larger than my tops on all sides. If you would prefer not to use scraps, you need to cut one more piece of background 10 inches by the width of fabric and substitute it for the scrap strip I show below. Sew together your back according to the diagram below. Step 22: Cut a piece of batting 64 inches x 84 inches and baste your quilt together. Quilt as desired. I straight line quilted my rings in alternating directions, like a volleyball. Step 23: Bind and finish your quilt. You will need 290 inches of binding for the quilt. I cut 7 fabric strips that measured 2.5 inch by the width of fabric. One generous size throw quilt, measuring 60 by 80 inches to snuggle under. Thank you so much to Moda for letting me share my quilt! I would love to see any of your creations from this tutorial in the Moda Bake Shop Flickr group. Thank you for stopping by!